Inventing pipeline the humanity made a grand thing. That was a huge step to home comfort. And then, as usual, that was the time of improvements and searches for the best possible solution. Organic chemistry allowed to use polymer materials to create pipes. Therefore there appeared the pipes of the XXI century which contained advantages of pipes- predecessors and got completely unique characteristics. First of all pipelines got out of the fear to be attacked by corrosion which was essential for metal pipes. The second, they significantly lost in weight and facilitated the mounting process for the people. The third and the last step to the perfection were: electrochemical neutrality, high stability to ground currents and noiselessness. Certainly, the pipelines got durability because any engineering system in the city just obliges to operate minimum throughout of all the life-time of maintained objects. High-density polyethylene (HDP, PE) became the most popular among polymer materials which are used to produce pipes. Solid polymer of white color gained the palm of the victory among thermoplastic polymers and became an ideal solution for pipeline systems of gasification, water supply, canalization and others. Polyethylene (PE) gracefully blends high stability, sufficient elasticity and «working efficiency» in wide temperature range: -60… +60 °С. Polyethylene is characterized by only slight modification of electrical properties in wide frequency and temperature ranges, low vapor and gas permeability, low permeability for water vapor and water itself. HDP pipes are inactive to the impact of different chemical agents: they don’t react with concentrated alkalis, acids and salt solutions. Polyethylene is safe; it does not separate agents harmful for people. Moreover, the ability to be processed makes PE the cheapest addition plastic. Operational and research experience determined that HDP pipes can be used during more than 50 years without any mechanical and chemical modifications. Design life is provided by the ability to operate at the temperatures – 40 … +40 °С (exploitation without pressure – till +60 °С). High elasticity is important characteristics of the pipeline system. 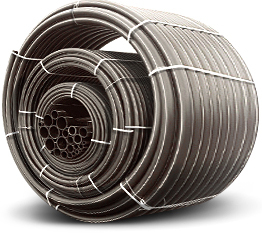 Polyethylene pipe can be stretched to 70% without losing its characteristics. This ability is able to make building subsidence not disastrous. Such kind of properties as fine inside finish of HDP pipes makes the friction insignificant what is ideal for the transportation of the oil. The factor of «no adhesion» of the deposits to inside surface of the pipes is also important; such the way the inner dimension will never been decreased. This is explained by almost zero dipolar moment of polyethylene pipes. PE pipes can be connected by any type of welding because the material is perfectly welded obtaining uniformity. Pipe breakage during the test for internal pressure usually occurs out of the welding area.